You will note that I am purposely choosing films that were, on the whole, very well-subititled. My entire "brand" is showing how "A" work can be "A+" work. These are two more examples from the film Yves St. Laurent. 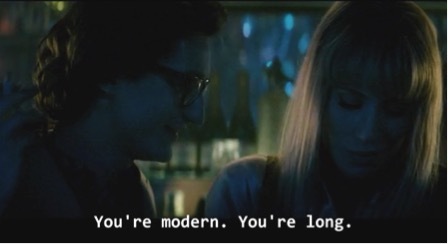 Taking place in a loud discothèque, the line is hard to make out, but it does indeed sound as if the actor says: “Vous êtes longue.” He can only be referring to her physical appropriateness as a model, but “you’re long” is not a sentence that an English speaker would use. Of course, ideally you have a relationship with the director or the screenwriter that you can consult to confirm original intent, but often by the time it's in post-production, they are into other projects. 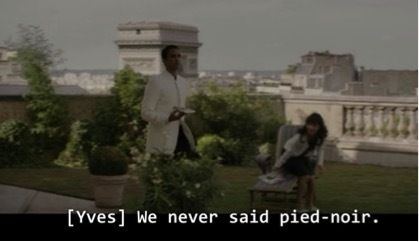 In this scene (the line is said off-screen, with is why [Yves] is bracketed) St. Laurent is actually lamenting that the mainland French have started to marginalize the French of colonial North Africa returning from Algeria in 1962 by calling them “pieds-noirs” (which literally means “black feet,” a derogatory term implying those forced to leave after Algerian independence were somehow racially tainted.) In French, he uses “on,” which is translated here as “we,” but literally means “one,” as in: “One never used to hear pied-noir before.” This change in pronoun would somewhat clarify the subtitle, but pied-noir is still a term most English speakers would not understand.